Americans love a good road trip, but something about Mexico makes us stall in our tracks. Ladies and gentlemen, there are safe parts of Mexico. I’ve completed four Mexican road trips on my own and was never once harassed by police, bribed by border patrol guards, or corpse-messaged by drug cartels. Mexican bicentennial independence from Spain and the centennial of the revolution coincided in 2010 to much tourism ado, but both celebrations were overshadowed by the country’s highly publicized violence. In coordination with these events, Mexico opened ten new archeological sites, launched a slate of government sponsored cultural events, including the Ruta 2010 project which marked several new culturally themed road trips with purple road signs to help guide you along. In 2011, Google added Mexico to its popular Google Maps Directions (finally! ), making driving even easier. And if you needed a final reason to hit the road, here it is: You cannot begin to understand the nuances of Mexican culture until you put down your margarita and leave the heavily touristy beach areas. 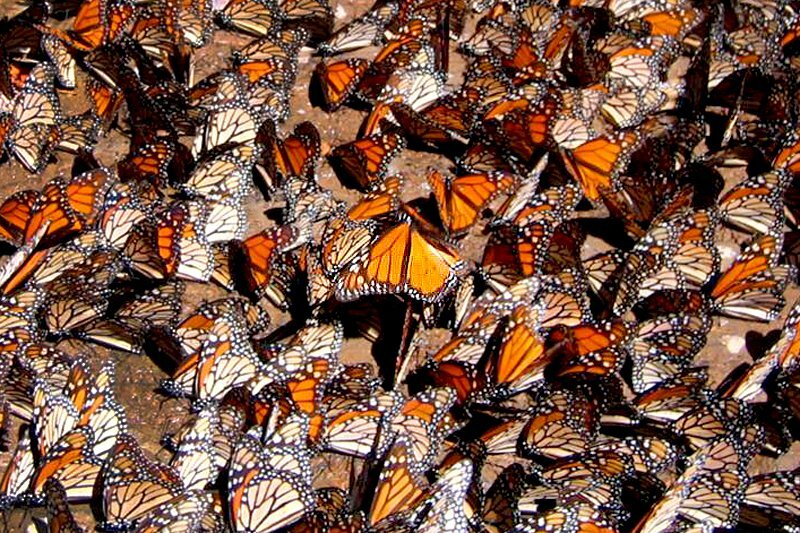 One such journey takes you to the State of Michoácan’s , in Angangueo, the famed winter breeding ground of the monarch butterflies. The best way to access it, as I did, is to fly into Mexico City and rent a car for the two-hour journey. Get on Mex-15-D west to exit Mexico City towards Toluca, then resume Mex 15 and continue west through the subtropical Toluca Valley towards the arid highlands. The trip takes you through dusty mountain roads, past strange ruins and mysterious mountain monastaries, and eventually into the fragrant transvolcanic pine forests. Michoácan’s volcanic fir forests are hidden well in the central highlands, so you’ll also want to pay close attention to road signs and directions. Be sure to arrive at the butterfly sanctuary by noon, when the butterfly activity peaks. Once there, 100 million monarchs await. All season, from November to March. The butterflies migrate annually to the three butterfly sanctuaries in this area located about 40 miles east of Morelia, but Santuario de Mariposa el Rosario is hands-down the best. The fir forests are ablaze with orange flutters, a sensory experience completely unique to interior Mexico. The branches of the pine trees are heavy and laden with orange butterflies; the air is heavily trafficked with zig-zagy saffron and black flight patterns. There are so many butterflies, you can hear their collective wingbeats fill the still air. In some places, the ground is so deep with resting butterflies, it resembles a bed of autumn mums. This experience is impossible to experience technologically, no matter how high your TV definition is. Amazingly, the migration grounds weren’t discovered until 1975 when they were reported in National Geographic. Until then they were unknown to everyone except local Purépucha (native Mexican Indians). The trail to the mountaintop groves is a rugged, high-altitude trek exceeding 10,000+ feet, so take it easy and drink lots of water, even if you’re driving most of it. You can hire a guide (Great Tours’ Luis Jiménez is a good one: [email protected] or + 443-353-2442) or pay local children to show you the secret trails. As I chugged up the rocky dirt road, one particularly daring local boy jumped onto the side of my moving car as it careened around a precipitous corner and insisted that he become my guide for 50 pesos ($5). I couldn’t resist his entrepreneurial spirit. The reward was that he showed me local trails that the tourists don’t take — worth every peso. Most visitors to the area arrive on buses and depart before lunch, but the homestyle cooking at cozy Los Arcos (Plaza de la Constitucion 5A) in the tiny town of Angangueo at the base of the sanctuary is an good reason to stick around, not to mention an ideal place to refuel on atole (a hot corn drink), a heap of guacamole served in a giant lavarock molcajete, and chicken-stuffed tamales. Besides, you have more to see. Soldier on for another two hours down the corkscrew toll-roads to Pátzcuaro (15D to 43D), passing the Pureapuecha ruins of Tzintzuntzan (The Place of Hummingbirds) on a windswept plateau overlooking Pátzcuaro Lake’s villages, which are known for their crafts, like beautiful guitars, lacquerware, and copper. Dream about the experience at the elegant and old fashioned (a member of the presitgious collection, with rooms from $85/night), It's been run by the same family since 1790. They're good for a few more detours. Adam is a Brooklyn-based freelance food and travel writer for the New York Times, Conde Nast Traveler, National Geographic Traveler, Travel + Leisure, and others. He travels to solve mysteries. Get to know him better: Read Adam's FATHOM Questionnaire.